This is the last of Arts Music�s recordings of Verdi�s great middle period trio. They are derived from studio performances recorded in Germany between 1973 and 1977. The 1975 La Traviata is the soundtrack of a TV recording. Conducted by the Verdi stylist and specialist Lamberto Gardelli, and with Mirella Freni as Violetta, I gave it a warm welcome in my earlier review. Issued contemporaneously was a 1973 recording of Il Trovatore (review). Whether that Il Trovatore was connected with any TV transmission was not made clear, nor is it with this studio Rigoletto. Otherwise the only link between the three issues is the presence of Franco Bonisolli in the tenor lead of each. On stage he cut a fine dashing figure. His singing is always ardent but sometimes excessively so to the point of coarseness, as I noted in Il Trovatore. 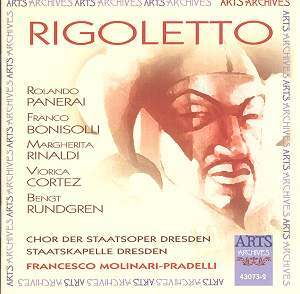 In this Rigoletto, his opening Questa o quella is appropriately light-hearted and sung with clear open-throated tenor tone (CD1 tr.2). Better still is his heartfelt rendering of Ella mi fu rapita�Parmi veder le lagrime (CD 1 tr.10) as the Duke wonders what has happened to Gilda; there is no reprise of Questa o quella as the track-listing indicates. But best of all is his vocal élan in La Donna e mobile (CD 2 tr. 3) where he varies his modulation and phrases with care. Maybe I should have expected this sensitivity to the nuance of the words from his careful matching of the singing of his Gilda, Margherita Rinaldi, at the conclusion of their act one love duet. Far too often tenors sing at their partner at this point as if they were a few streets away. Here, the pair duet on a falling diminuendo in a most sensitive and appealing manner (CD 1 tr.7). Margherita Rinaldi is a light-toned Gilda in the act one scena and in her aria, Gualter Malde, as she muses on the name the incognito Duke has given her (CD 1 tr.8). Although giving the impression of having to reach for some of the higher notes she manages the coloratura with only the slightest sign of strain. In Tutte le feste, as Gilda confesses to her father her deceit at meeting the Duke, and the consequences, she fields more colour to her tone (CD 2 tr.2). This has the effect of accentuating the slight fluttery vibrato of her earlier aria. Whatever the virtues of the other principals, any performance of Rigoletto depends on the name part. In this recording Rolando Panerai is a mixed blessing. Far too often he puts too much pressure on his big voice for dramatic effect and his tone becomes unduly harsh and even thin. This detracts from his characterisation in parts of both Pari siamo (CD 1 tr. 5) and Cortigiani, vil razza dannata (CD 2 tr.1). In the latter his beseeching of Marullo is well done with welcome variation of tonal colour. Just what range of tonal colour can be found in this role is well shown by Giuseppe Taddei in the Warner re-issue of the 1950s Cetra recording. That set also has the sensitive singing of Ferruccio Tagliavini as the Duke. review). Whilst that performance is at a comparative price level to this bargain price Arts issue, its mono and rather boxed sound cannot compete. Of the other singers on this issue, Bengt Rundgren�s Sparafucile is strongly sung (CD 1 tr. 4 and CD 2 tr.5) whilst Viorica Cortez brings rich tones to Maddalena�s persuading of her brother to renege on his deal with Rigoletto and kill the next person to enter their house, rather than the Duke. The minor roles are variably sung with the Monterone being particularly weak. The stereo recording is set at a very low level with the voices well forward of the orchestra to the extent that the opening prelude is far too quiet and does not convey the coming drama. This balance also restricts the impact of the storm in act three. It�s also a barrier to realistic assessment of Molinari-Pradelli�s generally supportive conducting. The booklet has a track-listing, a synopsis in three languages and a full libretto in Italian without any translation. I cannot understand why the whole of act two was not put on CD 2; there is more than enough space. It should be noted that the total disc timing for CD 1 given in the listing is wrong, as is the timing given for the prelude; no Rigoletto prelude lasts over five minutes! I have given the correct timing above.